Last year alone, an estimated 98,000 people were treated in emergency rooms for trampoline related injuries. 82 percent of them were children under the age of 15. Warnings on trampolines say no flips, no jumpers younger than 6 and only one jumper at a time, but those warnings are often ignored. Koeppen pointed out videos from YouTube that show children jumping and falling from trampolines. Rabinoff says people don’t realize trampolines are a danger in their backyard. Rabinoff demonstrated to Koeppen how jumping with more than one person can throw you off. 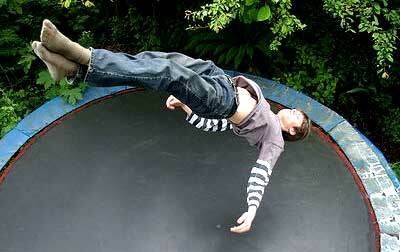 The article goes on to state that ‘safety nets’ placed around the trampoline can reduce accidents by up to 50%. However, they are not required by law. In addition, and take note – insurance companies may not necessarily cover trampoline accidents on their policies. Coming from Florida last year, where I practiced plaintiff personal injury law, I can tell you that I was contacted on more than one occasion by families who had a loved one injured as a result of a trampoline accident. Each time I would check the homeowner’s policy of the responsible homeowner, (if they even had homeowner’s insurance; some didn’t) there was the EXCLUSION for such accidents! No coverage! The article also suggests that trampoline owners should erect fences around their property, to prevent others from wandering on the property and injuring themselves on or around the trampoline. I, for one, will not be allowing my first-born son on any trampoline anytime soon. In this line of work, you really do get to see the worst of what can happen, when a chain of events causes something to go terribly wrong. Why ask for trouble? According to an article published by WebMD, a recent study suggests that most people who experience minor strokes or transient ischemic attacks (TIA’s) do not recognize their symptoms and/or do not seek timely medical attention.A stroke is generally defined as an interruption of blood flow to the brain. Strokes can be divided into two categories: hemorrhagic strokes and ischemic strokes. TIA is a condition that manifests itself with stroke-like symptoms for less than 24 hours. TIA does not by itself result in lasting neurological damage. However, people who experience TIA episodes often develop strokes. According to the article, one in 20 patients with TIA will develop a major stroke. After interviewing about 1000 patients, researchers concluded that about 70% of the patients did not recognize TIA or minor stroke symptoms and that less than half of the patients with these conditions sought medical attention within three hours from the onset of symptoms. If you are at an increased risk for developing a stroke, ask your doctor for information on TIA and stroke symptoms. Early medical intervention is key in treating stokes. Please take some time to familiarize yourself with some of the TIA/stroke symptoms. Remember – time is of the essence in getting treatment. Certain therapies (e.g. tPA) simply can not be administered to you if too many hours pass. Parental Pre-Injury Releases: A Victory for the Children of Florida! Two years ago, when I was practicing law in Florida, the Florida Supreme Court decided the case of Kirton v. Fields. As a consumer justice attorney, I was proud to be able to stand behind such a law and give it my support. In Kirton, the Court held that public policy concerns negated the enforcement of pre-injury releases executed by parents on behalf of their minor children regarding participation in commercial activities. Last week, the Florida House unanimously passed a Bill that supports the Florida High Court’s decision and limits the type of activities that may be included in such a release. Senate Bill 2440 is the Bill that will help protect Florida’s children in this regard. [T]he dangers or conditions that are characteristic of, intrinsic to, or an integral part of the activity; the failure of the activity provider to warn of the inherent risks; and the risk that the minor child or another participant may act negligently or intentionally and contribute to the injury of the minor child. Yesterday, the governor of Florida, Governor Crist, signed this pro-consumer piece of legislation into law. KUDOS to the Florida Justice Association for their hard work and effort in helping to make sure this Bill got to the governor’s desk. OK – so I’m a bit late with this one – since it was posted on April 21st – but sometimes even an ‘old’ post is worth a comment or two. Some of these doctors are excellent, but many are simply “notable.” They may be well-connected, in leadership positions, or presidents of this or that society. Many are excellent self-promoters, branding themselves through the name brand institutions they work for and the billboards that increasingly advertise their faces. Many are simply well-known or popular among their peers. Well, he’s spot on with that one. Of topical interest perhaps in the legal arena is that unless the opposing lawyer is asleep, objections in a courtroom to the question – “Doctor, have you ever been listed in (fill-in the name of the local magazine that rates physicians) as a ‘Top Doctor’?” are universally sustained by the judge. Maybe judges understand better than the public that ‘Top Doctor’ status may not really be relevant to a physicians ‘expertise’ in a given subject area. [T]he issue in medical care isn’t your doctor’s reputation. Instead, it’s the extent to which he or she is able to spend time with you, think about your problems, and render good advice. Let me add a few other suggestions: While you are spending time with your doctor, if you are dealing with a life-threatening or potentially life-altering condition and not just the common cold, you may want to find out what his/her experience is in dealing with your condition. In the right situation ask – is a referral to a specialist advisable? Perhaps a second opinion? If a course of treatment is recommended, are their alternatives? What are the risks and benefits to each approach? Does the recommended treatment have any known and likely side-effects? Is there anything in your medical history that puts you at greater risk for known complications? I suspect that somewhere during the course of the informed consent discussion with your physician, you or a family member will get a pretty good sense of whether the physician with whom you are speaking is the person for you and truly is one of the Best Doctors for your condition and treatment. There’s a lot of talk about the medical profession learning how to improve on patient satisfaction. Why should you care if others think your doctor is tops or the best in some magazine? While this may be a way to initially chose from the dozens of specialists in any given area, it should not be the end of the search. Choice of physicians – as with any group – yes, even lawyers – is there for you. Once you are in that physician’s office, only you can decide if he/she is the best doctor for you and you alone. Also – keep in mind that not all the best doctors (or lawyers, or candlestick makers) are listed in such publications. Whether your doctor is or is not is perhaps of no moment. I have always believed in a system that is based on common sense – be an educated patient, ask questions, listen to the answers and follow your brain and your heart. While it does not guarantee a great outcome, you will have at least done what you can do to make sure that – your doctor is the best doctor for you! We continue to report on stem cell research since it is clear that the joy and exuberance of researchers may one day (hopefully not too far away) translate into cure and joy for many afflicted with and suffering from a variety of diseases. While our earlier reports have somewhat centered on stem cell research in the field of cerebral palsy, rep0rts continue to surface as to a variety of other positive advances relating to adult disorders. As a side note – you may wonder why a law firm, whose task it is to represent those injured by the negligence of others, would have any interest in positive medical news. The answer is quite simple – having had the privilege of representing injured clients and making their lives a bit better monetarily, lawyers are always limited in just how much they can do to improve the quality of life for their clients. It is the medical community that will ultimately make the difference in alleviating if not curing these life-altering disabilities. Therefore, we at Nash & Associates have decided that in our blog, we will not only report on strictly legal issues (verdicts, key appellate decisions, changes in the law, etc. ), but also on key medical news (the good, the bad and the ugly) including significant medical advances. Contrary to what many cynics say about the legal profession – it is not all about the money. This point in history marks a period of approximately one year since President Obama removed limitations on research into embryonic stem cells. While significant amounts of research money was to be devoted toward this research, the financial crisis has no doubt had an impact on freeing up this financial commitment. What is of significance, however, is that the answers to many advances in treatment options using stem cells may lie in non-embryonic stem cells. A recent posting in Top News suggests that the excitement in the research community is in large part based on their recent discovery that adult stem cells taken from a patient’s bone marrow or belly fat may yield positive results equaling those of embryonic stem cells. Dr. Joshua Hare, Director of the Interdisciplinary Stem Cell Institute at the University Of Miami Medical School stated that adult stem cells are more flexible than they had thought. 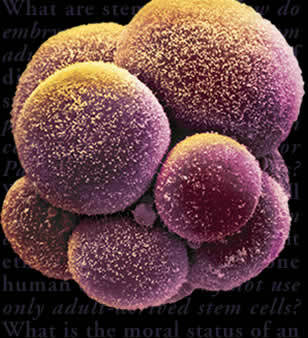 The embryonic stem cell may not be the one that proves to be really successful in the actual therapy. His institution has already been injecting the area around a patient’s heart so as to help heal the tissue injured in a heart attack. It is also noteworthy that adult cells are also being used in research programs to bring about improvement in functioning of patients with injured spinal cords. For those of you interested in advances in stem cell research, there are many excellent blogs and reports appearing on almost a monthly, if not weekly basis. 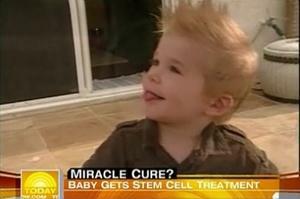 You may want to check out The Stem Cell, The Stem Cell Blog and a new friend of ours on Twitter – cellresearch. There is also a very helpful and informative site created by the National Institute of Health, which provides a very good basic understanding for the public of what stem cells are, the government’s policy on stem cell research, current research projects and the like. Guidant’s Guilty Plea for Failure to Notify FDA of Defective Defibrillators Takes New Twist – Will Plea Agreement be Accepted by the Court? Just over two weeks ago, the newswires were advising the public that Guidant LLC, a unit of Boston Scientific Corp, had been implicated in short circuiting failures of three models of their implantable cardioverter defibrillators (ICD’s). At issue in the charges brought last November by the Department of Justice were 20,146 devices identified as the Ventak Prizm 2 and Contak Renewal 1 and 2 defibrillators. It was also reported that Guidant pleaded guilty to the criminal charges. Guidant’s defibrillators became available to the public in 2005. The implantable cardioverter defibrillator (ICD) is a life saving battery operated device much like a pacemaker that is placed near the heart in a minor surgical procedure. This device detects abnormal heart rates and rhythms in the patient and delivers an electric shock to make the heart beat normally again. These save millions of people in the US and all over the world from sudden death. This plea agreement is currently being considered by U.S. District Court Judge Donovan Frank, who announced at a hearing on April 5, 2010, that he would make his decision as to whether or not to approve the plea agreement within three weeks of that last hearing. If he stays within the self-imposed time limit, his decision should be announced this coming week. Last week, however, a new twist to the case was reported by several news sources, including one posted by Reuters this past Thursday, April 22, 2010 – “two cardiologists who cared for a 21-year-old college student who died when his implantable defibrillator made by Guidant failed to deliver a life-saving shock are urging a federal judge to reject a plea agreement with the company.” These physicians are identified as Dr. Robert Hauser and Dr. Barry Maron. “We are extremely dismayed by the U.S. Attorney General’s decision to enter into a plea agreement with Guidant LLC, rather than prosecute the company and the individuals responsible for this egregious act. “On behalf of the patients who died or suffered pain and mental anguish as the direct result of Guidant’s illegal and unethical behavior, we urge you not to accept the plea agreement. Whether the judge heeds the words of these physicians or not remains to be seen. What is absolutely laudatory is the fact that these physicians have expressed their outrage as to this manufacturer’s conduct. Are they not correct – the money paid both through civil settlements and, if approved, by virtue of the criminal charges will be “entirely borne” by the company’s shareholders? Where is the personal accountability for this outrageous conduct? Our system of justice is one not only of compensation to the victims of such heinous conduct but also should serve to deter other individuals from taking the same life-threatening conduct in the future. There is nothing like a good long jail sentence for those involved in this horrible scheme to deter other corporate executives from going down the same path of profit at all costs – even to human life. Francis Keller, 21, presented to Dr. John S. Madras complaining of pain in his gums. 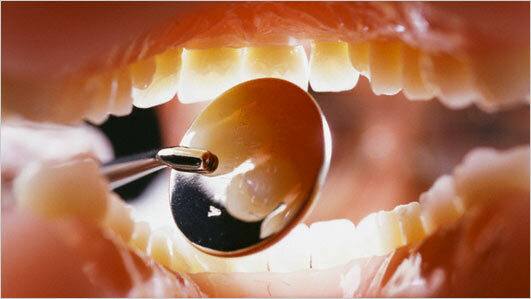 Mr. Keller was told he needed a routine cleaning and that his wisdom teeth would need to be removed. Mr. Keller returned a few days later for his cleaning, but, having informed Dr. Madras of his angioedema condition (a genetic immunity disorder with severe risk for swelling from incurring trauma to the hands or face), the cleaning was deferred. The dental hygienist contacted Dr. Richard Goldstein and was informed that Mr. Keller could not undergo any dental procedure until medically cleared. Dr. Madras referred Mr. Keller to Dr. George Flugrad for wisdom teeth removal, and the procedure was performed on August 4, 2005. The following day, Mr. Keller awoke with difficulty breathing. Within the next fifteen minutes, his throat swelled causing suffocation. Doctors Madras, Goldstein and Flugrad were all named as defendants in the case. During the trial, there was apparently great debate over whether Dr. Flugrad had been informed of Mr. Keller’s condition, and whether the patient had actually been cleared for surgery. The following is from the report of the case provided by Verdict Search. Counsel for Flugrad and Madaras both argued that Keller was comparatively negligent, as he had been well advised of the risks of surgery. Counsel for Flugrad also contended that Keller claimed he had been cleared for surgery. Counsel for Flugrad also claimed that Madaras telephoned him during the evening of Aug. 4 and they discussed Keller, but Madaras never mentioned that Keller’s physician had not given him medical clearance for dental surgery. Counsel also argued that Keller claimed he had been cleared for surgery. Madaras admitted to speaking to Flugrad on the telephone on Aug. 4, but claimed there was no discussion about Keller, rather that the call was simply to wish Flugrad well on a two-week vacation he was commencing on Aug. 5. The jury appears to have resolved the conflict in the patient’s favor – Dr. Goldstein settled with the family for a sum of $250,000; a New Jersey jury awarded Mr. Keller’s family a verdict of $10,200,00.00. You are currently browsing the Medical Malpractice and Catastrophic Injury Litigation | Eye Opener: The Nash & Associates Blog blog archives for April, 2010.